The town of East Kilbride stands some eight miles south east of the centre of Glasgow. It is separated from the Glasgow conurbation by a mile and a half wide strip of green belt land that, to date at least, has successfully preserved the town's distinctness: and while its proximity to Scotland's largest city has allowed it to serve as a dormitory, it is also a significant commercial and industrial centre in its own right. East Kilbride is best known as the first, the most populous, and by some measures the most successful, of Scotland's new towns. 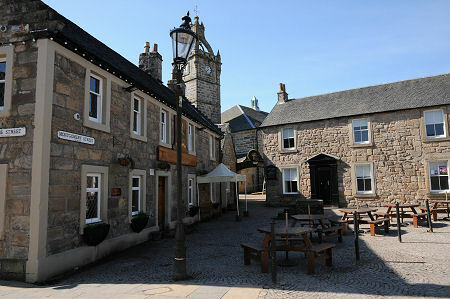 Until the end of World War II, East Kilbride was a modest village with perhaps 3,000 residents. It has since grown dramatically, and by 2012 its population stood at just under 75,000 people. As with some other new towns, the area of the original village is still clearly identifiable. Unlike some others, the major central developments of the new town were located within easy walking distance of the older village, which has allowed the two to complement one another as the town has evolved. Today's East Kilbride has as its focus what South Lanarkshire residents know as "The Centre". This is an extremely large set of interlinked shopping malls developed in six phases between 1972 and 2003. It is bounded by the dual carriageway A726 to its south, and for first time visitors the key challenge is working out how to reach the car parks you can see from the surrounding roads. For some years plans have been in place to invest £400m in a major redevelopment of the older parts of the town centre. These will see the number of car parking places increase dramatically and replace some of the earlier phases of the shopping centre. They will also see the replacement of some of the surrounding developments dating back to the first few decades of the new town's life. The plans appear to be on hold pending improvements in the wider economy. In the meantime it is possible to see the different phases of development and appreciate that while the most recent, "Centre West", built in 2003, is wearing very well indeed, some other parts have a more obviously dated feel. 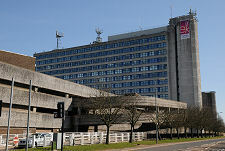 The proposed redevelopment would see the replacement of East Kilbride's Civic Centre, a large concrete complex of buildings on the north side of the town centre. 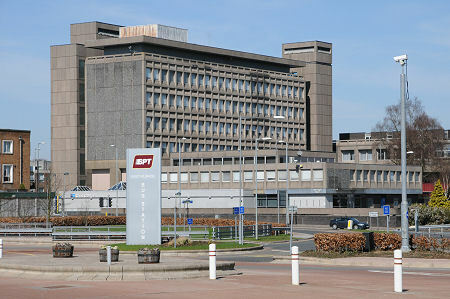 This was built in the 1960s, and from 1975 to 1996 served as the headquarters of East Kilbride District Council. 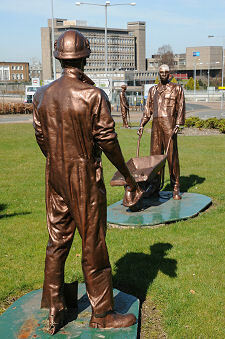 The district council merged to form part of the unitary South Lanarkshire Council in 1996. At the time many thought this would marginalise East Kilbride: it doesn't appear to have done so in practice. The commercial and administrative core of East Kilbride is wrapped around by all the other features you'd expect to find in a fairly large town. Different phases of residential development mirror those found in other Scottish new towns. The initial growth was achieved using publicly funded housing, mainly low rise flats or houses, and in more recent years private sector developers have taken the lead. Transport is looked after by the bus station at one end of the shopping centre, and the railway station. The road network was designed in an era when everyone was expected to own and use a car, and the many roundabouts have led to East Kilbride being known to Glaswegians as "Roundabout City". Leisure facilities have not been overlooked. The Dollan Baths complex opened in 1968. There is also an ice rink, and as this is Scotland there are plenty of golfing opportunities in the countryside surrounding the town. The Calderglen Country Park stands on the east side of East Kilbride, while to the north is the James Hamilton Heritage Park, with a 16 acre loch and the restored Mains Castle. In green belt land on the north west side of East Kilbride is the National Museum of Rural Life, complete with a working farm. Meanwhile East Kilbride Village is home to the Village Theatre. The origins of East Kilbride are probably fairly ancient. In 1800 the name was recorded as "Kilbride". The "East" seems to have been added when a Post Office was established here in the 1830s, presumably to distinguish it from what became West Kilbride on the Ayrshire coast. The name itself suggests that the original settlement formed around an early Christian church here dedicated to Saint Bride. Also known as Saint Brigid of Kildare, she was an Irish nun and abbess who lived from 451 to about 525 and had many Scottish churches dedicated to her. Later settlement in the area included a number of castles, notably Mains Castle to the north, Torrance Castle to the south east, and the no longer standing Lickprivick Castle (named after the family who built it in the 1300s) on what is now the site of a housing estate a short distance to the south west of the town. By the 1700s the village of Kilbride sat at the centre of a network of roads radiating out in all directions, but it was only with the development of the new town that it really began to grow, particularly from the 1960s onwards.